In order for Fucoidan to demonstrate its health power, the binding amount of sulfate group needs 13%! "Sulfuric acid group" contained in fucoidan is literally a component that forms sulfuric acid. Even if you say sulfuric acid, it is not about a powerful drug. Sulfuric acid becomes non-toxic when it is bonded with organic matter, and this state is called "sulfate group". Previous studies have revealed that the sulfate group in fucoidan plays an important role to demonstrate various health power. Fucoidan consists mainly of fucose, galactose, xylose, uronic acid and other ingredients. 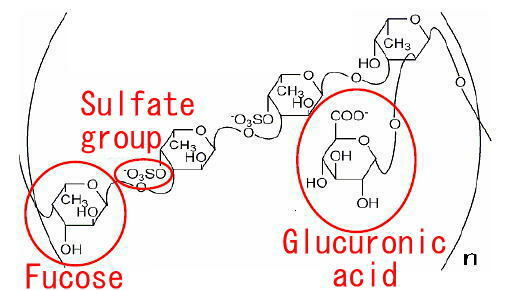 The characteristic of fucoidan is that it contains a lot of sulfate groups, which is a big difference with many other polysaccharides. The characteristic of the sulfate group is the ability to store moisture. It creates a condition like a slimy gel and gently roughens the surface of seaweed. In the human body it protects the body for health. Since the sulfate group is homogeneous to the viscous component of the human gastric mucosa, when fucoidan enters the stomach, it is well compatible with slimy ingredients of similar nature and is familiar. There are several types of fucoidan depending on the type of seaweed, and the structure of sticky slimy is different. Recent fucoidan studies have made it clear that Mozuku, which has many sticky ingredients, is the most preferable among seaweed for health. Mozuku contains about 5 to 8 times as much fucoidan as other seaweeds, and contains sulfated fucose, which is one of its constituents, more than other seaweeds. When choosing Fucoidan products, it is important to properly check the sulfate group content and the sulfate group binding amount, and to select a sales company that clearly indicates these numerical values and analysis results.